Maybe the thing I like best about breadmaking is that it accommodates my lazy, forgetful, procrastinating self. Good bread can’t be rushed. Great bread likes to hang around and chill. It likes to loaf just as much as I do. 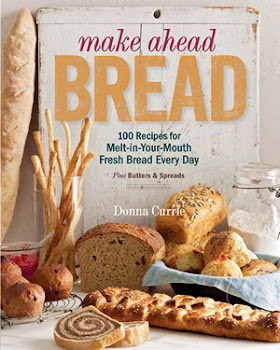 Pre-fermenting a dough – that is, letting it sit around for a while before it becomes a finished dough – amps up the flavor of your bread. That’s one reason sourdough is so flavorful – the starter spends a long time fermenting before it becomes part of a bread dough. For breads leavened with commercial yeasts, there are several types of pre-ferments and probably thousands of variations. There’s also some disagreement about exact terminology. Some authors call everything a sponge or a pre-ferment, and some disagree on other distinctions between the types of pre-ferments. Since Peter Reinhart is one authority I trust, I use his definitions when there’s disagreement. Pre-ferments can be broken into two categories: the wet (or sponge) and the dry (or firm) pre-ferments. The wet pre-ferments are the poolish and the regular sponge (in French, the levain levure, or sometimes shortened to levain). The dry pre-ferments are the biga and the pâte fermentée. A poolish is a wet, sticky mixture with equal weights of flour and water (or, in baker’s percentage, 100 percent hydration) and a very small percentage of yeast. Since wet mixtures ferment faster, this needs much less yeast than dry pre-ferments, but since it has such a small amount of yeast, the fermentation takes longer. That longer fermentation adds flavor to final bread product. More yeast is usually added to this when it is mixed with flour to make the final dough, but not always. A regular sponge (levain) is much like a poolish, except that most or all of the yeast is added at this stage. It ferments much faster, so there isn’t as much flavor development as with a poolish. However, this type of preferment allows bread to be made faster, since it might sit for as little as 20 minutes or an hour before the rest of the ingredients are added. More yeast might be added at that stage, but much less than with a poolish. A biga is an Italian style of pre-ferment, and it is made with less yeast than a regular bread dough and no salt. Baking books disagree on exactly how wet a biga is, with the hydration ranging from 60-100 percent. However, the majority seem to agree with Peter Reinhart that a biga has about the same consistency of a bread dough, and that something approaching 100 percent hydration should be called a poolish. The pâte fermentée is old dough – either a piece of dough that was saved from a previous batch of baking, or dough that was specifically made to be used the next day. Unlike other forms of preferment, this includes salt. For some old-world rye breads, and entirely different type of “old bread” is used to add flavor. Day-old baked bread is crumbled and added to the new dough. I’ve read tales of bakeries doing this “on the sly” because it didn’t fit in with food regulations, but it was the only way to make the bread taste right. Although a soaker isn’t technically a pre-ferment, it is very similar. The difference is that there is no yeast at all in the soaker. The point isn’t fermentation. This is often used for coarse whole grains, to help soften the grains and to allow the enzymes within the grain to become active and start converting the starch into sugar. The point here is that if a recipe tells you to proof and mix and knead and get it all into the oven as fast as possible, you don't have to stick to that schedule. Mix the flour, water and yeast, and let it hang around while you read the news or catch up on email. An extra 20 minutes or so will help the bread, not harm it. Bread wants you to take your time. Loaf a little. You deserve it.